I follow Eric Brown on Instagram (@ebrown_photo) whose young daughter, Pearl, died last spring. His Instagram account chronicles his journey with raw honesty amid a strong faith. In a recent post, he wrote: "It’s weird but I found solace in getting that first Christmas without Pearl behind us, and it seemed to bring about a shift, or a giant step forward in healing. But leaving behind the last year that Pearl knew... that’s hard. Changing the phrasing from 'my daughter passed away earlier this year' to 'my daughter passed away last year' only seems to magnify the distance felt...I haven’t felt God’s presence much at all this year... specifically these last 9 months, but I’m also learning that feeling his presence is hardly a measure of his presence. He’s here, but it has felt dark and barren nonetheless. And the Psalmists tell me that’s an okay thing to acknowledge." For some of you, although the circumstances may be different, you can empathize with Eric’s sentiment as we move from the ending of one year into the start of the next. I can certainly relate as this was the first Christmas without my brother Doug. None of us know what the new year will hold, but we can all be confident that God will be with us, through all the light and dark! There are 2 great conferences coming up for those of you (teacher or leader) who are interested in taking some next steps into authentic Christian education. 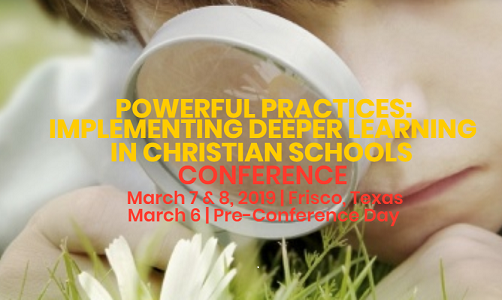 The “Deeper Learning in Christian Schools Conference” on March 7-8, 2019. This will be both a high quality learning experience that pushes you to the next step, and also a great networking opportunity where you will interact with many of the leaders in Christian education from across North America. The “International Transforming Education Conference on July 15-17, 2019 in Australia. To add to this learning experience, we are looking to organize a series of school visits following the conference as our Australian colleagues are doing some fantastic work that we’d like to learn more about. Let me know if you are planning to attend this conference so I REGISTER HERE can keep you informed about the study tour aspect. You may remember that PCCE has a partnership through EduDeo Ministries with a group of Presbyterian schools in Zambia. Over the years, several PCCE people have visited and provided leadership training to their administrators, in the areas of TfT, restorative practices, school culture and other aspects of effective school leadership. Last year’s session was cancelled due to a cholera outbreak, but this year everything is looking positive. I will be working with Karen Gerritsma, a retired principal from Ontario who has worked with this group of schools several times in the past. The Zambian leaders asked us to continue the TfT focus, as well as leading discussions around the teaching of human sexuality. In addition to the training sessions, Karen and I will spend a couple of days visiting schools. I will be gone to Zambia from February 2-19, 2019. During that time, feel free to contact the office, Jeremy Horlings or Hugo VanderHoek with any concerns or requests. Please take a few minutes to complete this FORM about Teachers’ Convention. We are always eager to provide a top-notch learning experience and would like your feedback. If you are interested in school leadership/administration, consider attending ELDI (Educational Leadership Development Institute). This an excellent one-week immersive learning experience where you will gather with others from across North America to learn and experience more about school leadership and whether it is something you want to pursue. REGISTRATION is now open. Note that this Institute is only open to members of CSI schools. Congratulations to your colleagues Gerald Noort (Lacombe Christian School) and Alan Riewe (Immanuel Christian Elementary School) who were selected to participate in the CSI Bible Symposium in February at the Museum of the Bible in Washington DC. Congrats also to Colin Ward (Covenant Christian School) who will be one of the session speakers leading a session on Dramatizing Scripture in the Middle School Classroom. “Don’t walk in the hallway!”??? Read this ARTICLE to figure out why that may be what you SHOULD be saying! This RESOURCE will assist you in making complex concepts more visual. TOOLS to try in 2019. Geoguessr looks particularly interesting (and fun)! 10 THESES about which (most) Christians with varying perspectives can agree. 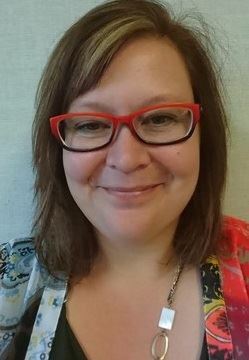 We welcome Terri-Lynn Emms as the new Leadership Cohort representative on the PCCE Board. Feel free to contact Terri-Lynn if you have any question or comments terrilynn@wrsd.ca. This conference would be beneficial to business/finance managers, promotions officers and board members. To facilitate participation, PCCE has funds set aside to subsidize/cover registration costs (depending on the number of registrants) for our members to attend. This is one way that we can maximize learning opportunities for our schools! When you register, select the “CSC Member Rate” and then let us know that you have registered so we can arrange reimbursement. 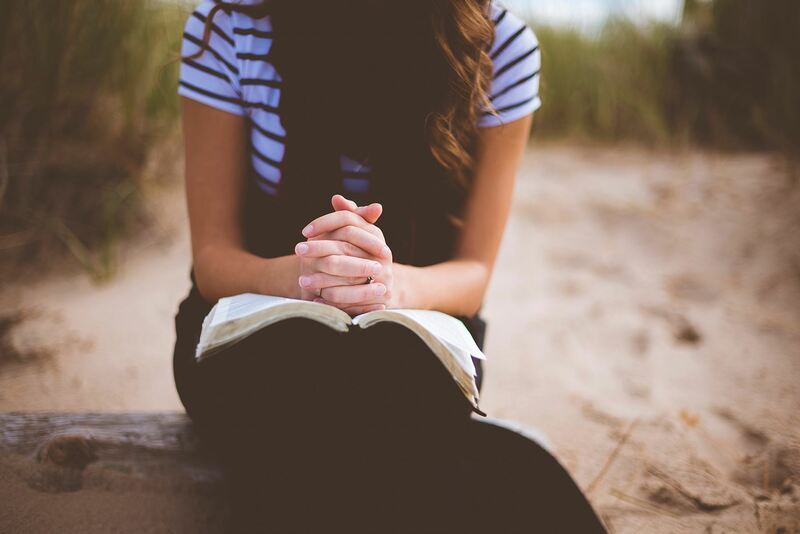 Bible program: if your school community wants to have a look at your K-9 Bible program with the intent of creating a program that promotes faith formation, we have a year-long PD resource to guide the process. As you make plans for next year, keep this in mind. CONTACT us if you’d like to see a copy of the resource. If you would like to engage in a year-long top quality learning experience, consider APPLYING for the Van Lunen program. Deadline is February 22, 2019. If you have someone at your community that shows an interest and aptitude for school leadership, encourage him/her to APPLY for the Educational Leadership Development Institute. PCCE will pay the registration cost for members. Note that this Institute is only open to members of CSI schools. Make sure you have saved the date for our spring Leadership Cohort Conference on May 9-10, 2019. This looks like a great seminar as it specifically addressed faith-based organizations. It is for Executive Directors, financial administrators, payroll administrators, HR administrators and leaders, and board members. Click HERE To register. Global Christian School Leadership Summit: Is being held in San Antonio from January 30-February 1, 2019. Looks like it will be a large conference with diverse voices. Our partner organization in BC is holding their annual Business & Development Conference on April 8-9, 2019. This conference would be beneficial to business/finance managers, promotions officers and board members. To facilitate participation, PCCE has funds set aside to subsidize/cover registration costs (depending on the number of registrants) for our members to attend. This is one way that we can maximize learning opportunities for our schools! When you register, select the “CSC Member Rate” and then let us know that you have registered so we can arrange reimbursement. Follow this LINK for more information and to register. One key responsibility of your board is to be a trustee of the school’s vision and mission and to use these statements to guide and direct the present and future. This ARTICLE has some practical advice on how to do this well. The Board met last weekend and had a full day of learning, discussing and guiding the work of PCCE. We are going to change the format of our AGM this spring and add a “workshop” component in the morning that will give attendees an opportunity to attend a session on an area of interest. We will offer 3-4 sessions focusing on a variety of topics relevant to school board members and other school leaders. We are hoping that rather than sending just 2 delegates, schools/boards will send several people to take advantage of this learning opportunity. More details later, but we encourage you to put it on your calendar! We currently have a vacant position in our Central Alberta region (between Millet and Innisfail), and as our current member from Calgary (Chris Weening) has completed his service, we will also be looking for a member from Calgary. If you are interested or know someone who may be good fit, please contact our OFFICE at ASAP. Also be sure to follow PCCE on Twitter!